The former Butte City is now the consolidated City and County of Butte-Silver Bow. Administrative offices are located at 155 West Granite Street, Butte, MT 59701; phone: 408-497-6200. 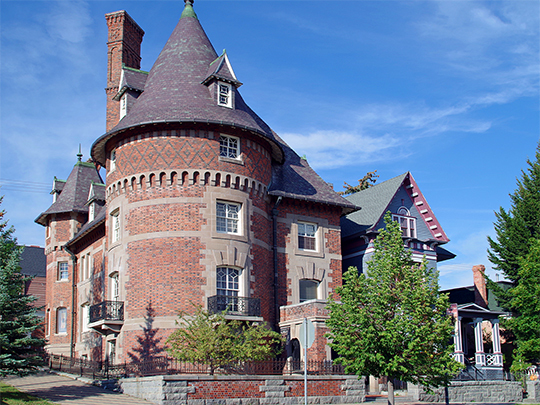 Photo: Charles W. Clark Mansion, ca. 1898, 321 W Broadway Street, Butte, MT. Listed on the National Register of Historic Places in 1976. Photographed by user:Robstutz (own work), 2013, [cc-by-3.0 (creativecommons.org/licenses/by/3.0)], via Wikimedia Commons, accessed April, 2014. The City of Butte lies on the north edge of a high mountain valley, surrounded on three sides by the continental divide. When hardrock underground mining ensued in the 1870s, the mining activity centered on the north slope, colloquially called the "Butte hill." As a matter of convenience, residential and commercial centers grew up on the hill adjacent to the mines. Smelters, which needed water and a level surface, established complexes at the foot of the hill, along Silver Bow Creek. These industrial centers and their adjacent residential areas on the "flats" marked the southern-most boundary of Butte's settlement. As copper mining boomed, the land between the mines and business district on the hill and the smelters and railroad yards on the flats filled in with residential and commercial activity. Butte's older neighborhoods on the hill, all of which exist within the Butte Historic Landmark District, date roughly from the 1880s to the 1910s. The biggest building boom on the hill occurred between 1895 and 1904 and the neighborhoods reflect this Victorian era. Clusters of worker's and Queen Anne style cottages cling to the hill adjacent to mining headframes along streets following contour lines. Below them, is the central business district and residential areas featuring closely-packed, turn-of-the-century buildings. Because of the increased demand for housing, high land values dictated full utilization of lots. As a result, yards are small and trees infrequent. However, as the copper mining industry continued to boom into the early twentieth-century, housing development began moving further south and west, off the hill and out onto the "flats." Suburban additions formed along extended streetcar routes on the level areas in the early 1900s after most of the smelter activity moved to Anaconda. Neighborhoods on the "flats" differed from those on the hill. Instead of dense clustering of worker's cottages and Victorian-era residences with little or no greenery, the suburbs contained mostly Bungalow-style houses on large lots, often near parks and adjacent to streetcar lines. Additions such as the Atherton-Place-On-The-Lakes, Montana Avenue, Gilman and Silver Bow Park feature elements of suburban planning. Both Atherton and Silver Bow Park have some streets with lawned center boulevards. Gilman Addition is next to Stoddan Park which has the public golf course and the private Butte Country Club lies within Atherton. The Montana Avenue Addition abuts the Mount Moriah Cemetery and Silver Bow Park originally contained a central park. Streetcar lines historically served all of these suburbs. Although bungalows predominate in these additions, it appears that they received their greatest in-fill after World War II. Janet Ore, Community Historic Preservation Officer, Butte-Silver Bow Local Government, Suburban Schools in Butte, Montana, nomination document, 1979, National Park Service, National Register of Historic Places, Washington, D.C.